Beautiful unissued authentic membership certificate from the New York Stock Exchange. 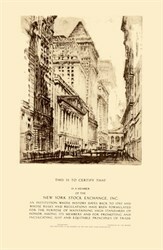 This historic document is a Intaglio printed on heavy paper and has an sepiatone image of the New York Stock Exchange and measures 14" x 20". The wording on the bottom is printed in raised print. This item came from the archives of the New York Printer, Andersen Lamb. The border around the image and wording is raised. This historic item would look terrific framed. The New York Stock Exchange (NYSE), nicknamed the "Big Board", is a New York City-based stock exchange. It is the largest stock exchange in the world by dollar volume and the second largest by number of companies listed. Its share volume was exceeded by that of NASDAQ during the 1990s. The New York Stock Exchange has a global capitalization of $23.0 trillion as of September 30, 2006. The NYSE is operated by NYSE Euronext, which was formed by its merger with the fully electronic stock exchange Archipelago Holdings and Euronext. The New York Stock Exchange trading floor is located at 11 Wall Street, and is composed of five rooms used for the facilitation of trading. The main building, located at 18 Broad Street between the corners of Wall Street and Exchange Place, was designated a National Historic Landmark in 1978. NYSE Group merged with Euronext, and many of its operations (particularly IT and the trading platform) will be combined with that of the New York Stock Exchange and NYSE Arca. As of January 24, 2007, all NYSE stocks can be traded via its electronic Hybrid Market (except for a small group of very high priced stocks). Customers can now send orders for immediate electronic execution, or route orders to the floor for trade in the auction market. In excess of 50% of all order flow is now delivered to the floor electronically. On the trading floor, the NYSE trades in a continuous auction format. Here, the human interaction and expert judgment as to order execution differentiates the NYSE from fully electronic markets. There is one specific location on the trading floor where each listed stock trades. Exchange members interested in buying and selling a particular stock on behalf of investors gather around the appropriate post where a specialist broker, who is employed by a NYSE member firm (that is, he/she is not an employee of the New York Stock Exchange), acts as an auctioneer in an open outcry auction market environment to bring buyers and sellers together and to manage the actual auction. They do on occasion (approximately 10% of the time) facilitate the trades by committing their own capital and as a matter of course disseminate information to the crowd that helps to bring buyers and sellers together. The frenzied commotion of men and women in colored smocks has been captured in several movies, including Wall Street. The right to directly trade shares on the exchange is conferred upon owners of the 1366 "seats". The term comes from the fact that up until the 1870s NYSE members sat in chairs to trade; this system was eliminated long ago. In 1868, the number of seats was fixed at 533, and this number was increased several times over the years. In 1953, the exchange stopped at 1366 seats. These seats are a sought-after commodity as they confer the ability to directly trade stock on the NYSE. Seat prices have varied widely over the years, generally falling during recessions and rising during economic expansions. The most expensive seat was sold in 1929 for $625,000, which, adjusted for inflation, is over six million in today's dollars. In recent times, seats have sold for as high as $4 million in the late 1990s and $1 million in 2001. In 2005, seat prices shot up to $3.25 million as the exchange was set to merge with Archipelago and become a for-profit, publicly traded company. Seat owners received $500,000 cash per seat and 77,000 shares of the newly formed corporation. The NYSE now sells one-year licenses to trade directly on the exchange. The origin of the NYSE can be traced to May 17, 1792, when the Buttonwood Agreement was signed by twenty-four stock brokers outside of 68 Wall Street in New York under a buttonwood tree. 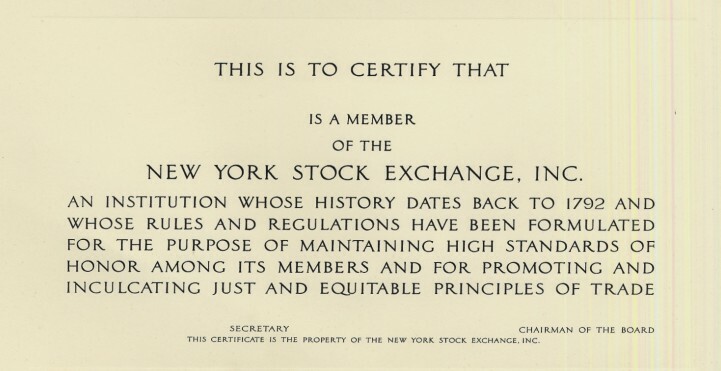 On March 8, 1817, the organization drafted a constitution and renamed itself the "New York Stock & Exchange Board". This name was shortened to its current form in 1863. Anthony Stockholm was elected the Exchange's first president. The first central location of the NYSE was a room rented for $200 a month in 1817 located at 40 Wall Street. But the volume of stocks traded had increased sixfold in the years between 1896 and 1901 and a larger space was required to conduct business in the expanding marketplace. Eight New York City architects were invited to participate in a design competition for a new building and the Exchange selected the neoclassic design from architect George B. Post. Demolition of the existing building at 10 Broad Street and the adjacent lots started on 10 May 1901. 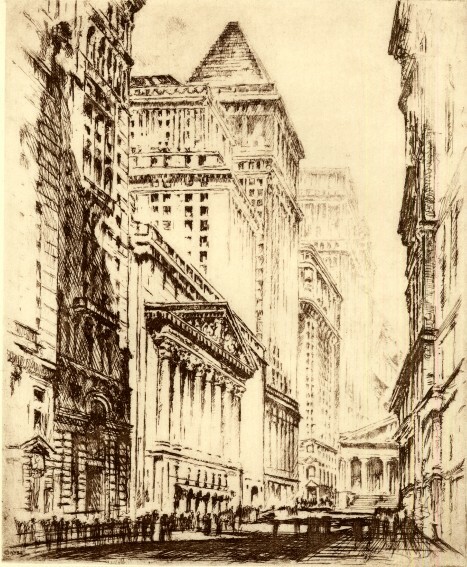 The New York Stock Exchange building opened at 18 Broad Street on April 22, 1903 at a cost of $4 million. The trading floor was one of the largest volumes of space in the city at the time at 109 x 140 feet wide (33 x 42.5 meters) with a skylight set into a 72 foot high ceiling (22 m.) The main fa�ade of the building features marble sculpture by John Quincy Adams Ward in the pediment, above six tall Corinthian capitals, called �Integrity Protecting the Works of Man�. The building was listed as a National Historic Landmark and added to the National Register of Historic Places on June 2, 1978. In 1922, a building designed by Trowbridge & Livingston was added at 11 Broad Street for offices, and a new trading floor called "the garage". Additional trading floor space was added in 1969 and 1988 (the "blue room") with the latest technology for information display and communication. Another trading floor was opened at 30 Broad Street in 2000. With the arrival of the Hybrid Market, a greater proportion of trading was executed electronically and the NYSE decided to close the 30 Broad Street trading room in early 2006. The Exchange was closed shortly after the beginning of World War I (July 1914), but it re-opened on November 28 of that year in order to help the war effort by trading bonds. On October 1, 1934, the exchange was registered as a national securities exchange with the U.S. Securities and Exchange Commission, with a president and a thirty-three member board. On February 18, 1971 the not-for-profit corporation was formed, and the number of board members was reduced to twenty-five. Following a 554.26 point drop in the Dow Jones Industrial Average which was a 22.6% loss in a single day, the biggest ever before in a single day (DJIA) on October 19, 1987, officials at the Exchange for the first time invoked the "circuit breaker" rule to stop trading. This was a very controversial move and prompted a quick change in the rule; trading now halts for an hour, two hours, or the rest of the day when the DJIA drops 10, 20, or 30 percent, respectively. In the afternoon, the 10% and 20% drops will halt trading for a shorter period of time, but a 30% drop will always close the exchange for the day. The rationale behind the trading halt was to give investors a chance to cool off and reevaluate their positions. As a matter of fact, Black Monday was followed by Terrible Tuesday, a day in which the systems did not work and people who wanted to buy or sell shares could not conduct their trades at all, for unknown reasons. Further information: Black Monday (1987) There was a panic similar to many with a fall of 7.2% in value on October 27, 1997 prompted by falls in Asian markets, from which the NYSE recovered quickly. Further information: October 27, 1997 mini-crash The NYSE was closed from September 11 until September 17, 2001 as a result of the September 11, 2001 attacks. On September 17, 2003, NYSE chairman and chief executive Richard Grasso stepped down as a result of controversy concerning the size of his deferred compensation package. He was replaced as CEO by John Reed, the former Chairman of Citigroup. On April 21, 2005, the NYSE announced its plans to acquire Archipelago, in a deal that is intended to bring the NYSE public. On December 6, 2005, the NYSE's governing board voted to acquire rival Archipelago and become a for-profit, public company. It began trading under the name NYSE Group on March 8, 2006. On April 4, 2007, the NYSE Group completed its merger with Euronext, forming the NYSE Euronext. Marsh Carter is the Chairman of the New York Stock Exchange, succeeding John S. Reed. John Thain is the CEO of the NYSE. Gerald Putnam and Catherine Kinney are the co-Presidents of the NYSE. 1896 - Dow Jones Industrial Average first published in The Wall Street Journal. 2006 - NYSE and ArcaEx merge, forming the publicly owned, for-profit NYSE Group, Inc.